The battle feild was set. It was surprisingly a bright, clear sunny day within the village of Ame. It seemed to be abandoned in the odd looking village. Perfect for a battle between two Akatsuki members. A short spout figure stood motionless within the strees of Ame hidden under the black Akatsuki cloak (including his tail) with few red clouds printed onto it. Not a singal motion was shown by this fat figure as his odd looking head poped out of the large cloak. Standing there seeming like he was sitting down Sasori looked right into the eyes of his opponent. Hidan. "Kukukukuku..... Prepare to be destroyed by my beautiful art." Sosori would say in a low deep voice. Sasori's tiny head would look up at his opponent and watched as he simply sat ontop of one of Ame's odd looking buildings. "Hurry up and stop wasting my time." Sasori would say in his usualy low voice so Hidan probably wouldnt have herd him. The peice of cloth hung down loose from his face as he watched Hidan spring into action. Dropping himself from above Sasori watched as the Akatsuki member simply fell towards him. Sasori felt insulted. Hidan was making it to easy. Once Hidan was about 20 yards in the air away from Sasori, the puppet master began his attack. The scorpion tail that laid hidden within his puppet casing came shooting out from the back of Sasori's Akatsuki cloak. Moving with incredible speed the tip of the scorpion tail would thrust right into the flesh of Hidan's chest. Not dont just yet, the tail would continue extending and smashed Hidan into the building which he jumped off of. Smashing the imortal shinobi right through the wall of the building creating a fairly big hole, Sasori would take the tail out of his flesh and braught it back to himself now keeping it released ready for battle. Looking at the hole where Hidan had been hit into Sasori said "Now lets see if he can make it back onto his two feet." The puppet master would lightly begin chuckling behind his mask. Hidan wasn't in the Akatsuki for no reason. He knew very well that he had left himself wide open. He had the abilities to make up for it, and besides, even if he did get hit, who cares? Certainly not him. As the mechanical tail came flying in to impale him, Hidan swung his scythe, deflecting the stinger away. Hopefully there was enough force behind the swing to damage the stinger at the end of Sasori's tail. Jashin's follower then landed onto Sasori's body and grabbed onto the puppet's face with his free hand. "I'm gonna pull this ugly head of yours right off!" Hidan roared with a huge grin as he began pulling the fake head right off its shoulders. Sasori watched as Hidan swung his massive syth hitting his tail out of the way. Making a tiny grunting sound surprised to see that he stopped the tail, the puppet master would let the immortal fall ontop of him. Sasori could only grin under his mask as Hidan grabbed onto his head and tried pulling it off. While Hidan did so it seemed he had already forgotten about Sasori's weapon. 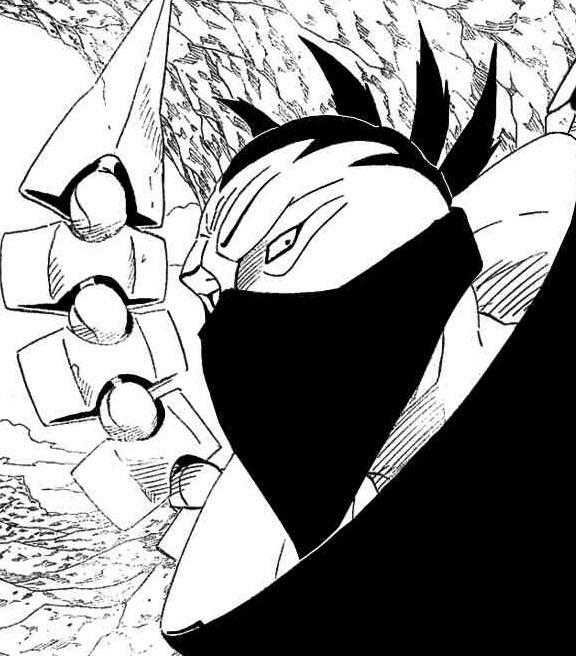 Extending his tail, the metal scorpion tail would swiftly wrap around Hidan's entire upperbody preventing him from pulling any further on the shells head and from using his syth. The pinser of the tail that Hidan had nicked was looking right at him as if it had eyes of its own. Stabbing right into the left side of Hidan's neck blood would squirt right out of the immortals body. The pinser had just injected Hidan with one of Sasori's infamous poisions. Pulling the tip of the tail out of his chest more blood would shoot out. Lifting Hidan up into the air, slightly releasing his tight grip around him Sasori would swing the tail over his head. Launching Hidan forward, the Akatsuki member would begin rolling across the ground as he connected with it. The poison would take affect within seconds of being injected so close to his heart. All of Hidan's muscles would cramp up and soon Hidan wouldnt be able to move an inch of muscles in his body. He would be completely paralyzed. Usualy the poison would also kill its target after paralyzing him but it seemed that Hidan was unable to die. "That wasnt too hard. Kukukukuku."